At Kateland, our goal is to showcase the driving American Miniature Horse. Kateland’s efforts to bring attention to and contribute to the American Miniature Horse breed have been recognized on a national level, and the popularity and respect of the breed as a driving horse has grown as a result of Kateland Farm. If you are a little short on driving smarts, then even a great horse will have trouble making you a champion. We offer lessons for single, pair, tandem, and multiples hitches. Despite training our own, we still find time for training outside Minis and any horse purchased from Kateland can be brought back for training. Kateland Farm has obtained the alias of “Mini Heaven,” and for good reason. It’s a dream come true for any little Mini Horse (or Mini Horse lover) to visit or live. Stud, Joni (pronounced “Johnny”), always welcomes outsiders for a stud fee of $500. After foaling over 300 Miniature Horses at Kateland Farm, you can rest assured that we have seen it all, and your broodmare is in good hands, literally. Need help getting your Mini ready for the show season? We’ve got you covered. Enjoy a getaway vacation on a working Miniature Horse farm. Our spacious farmhouse sits on a 28-acres surrounded by barns and pastures. This comfortable home will welcome up to 8 people for a peaceful getaway on the farm, where you can experience what it’s like to live and work on a farm. Enjoy touring our museum of over 10 Miniature Horse replicas of carriages from a Doctor’s Buggy, to Roof Seat Break, Surreys, and Back-to-Back Traps. 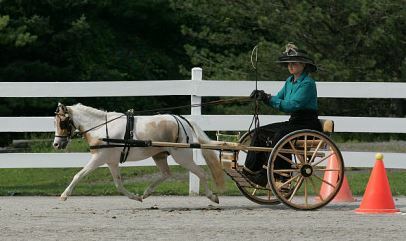 We offer a variety of Miniature Horse carriages and carts for rent. Hosting a child’s birthday party, 4-H group, or even a field trip? Consider a visit to the farm for educational, hands-on experience with the miniature horses. Pose for pictures, tour the barn, pet the horses, and go for a carriage ride. Tandems, randoms, trandoms, unicorns, four-in-hands, as well as pairs- You name it, and we’ve done it. At Kateland, we pride ourselves in our multiples hitches. The primary purpose at Kateland Farm is to breed, sell, educate clients, offer equine services and activities, and to showcase the driving American Miniature Horse. Since the establishment of Kateland Farm in 1989, Kateland’s efforts to improve, bring attention to, and contribute to the American Miniature Horse breed are outstanding, recognized on a national level, and are unlike any other. The popularity and respect of the American Miniature Horse as a driving horse has grown nationally as a result of Kateland Farm. The first Kateland Miniature Horse, a weanling named Katelin, was acquired from Mendon Equestrian Center in 1989. Since then, Kateland Farm has produce over 300 Miniatures, raising many to be driving horses. While many breeders have limited their programs to breeding for smaller and smaller Minis, Kateland’s exclusively designed breeding program has been directed toward breeding larger American Miniature Horses ranging from 33 to 38 inches, and training the horses to drive. Initially, the Minis were shown in breed shows, such as ones offered at the state fair grounds. 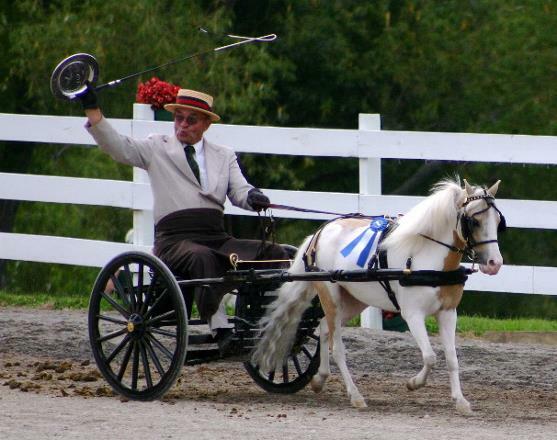 However, the acceptance of the Miniature as a special driving horse group by the American Driving Society in 1995 resulted in many opportunities to compete, and the farm has concentrated on raising competitive driving Miniature Horses. One of the largest pleasure driving competition in the world, Walnut Hill, was held in Pittsford, New York where the Kateland Miniatures have excelled in creating an excellent showing record. In 1998, Bill Remley asked Kateland Farm to form a Driving Drill Team for exhibition at the Walnut Hill Competition (pictured above). The team showed for many years with over 20 different drivers (whips) participating. The farm has three horse barns with one used for expectant broodmares, another for mares and fillies, and a third for geldings and stallions. A large indoor arena barn on the property has been converted to a special events barn and hosts weddings. The property also boasts a 40 x 80 meter gravel dressage ring. The 28 acre farm is laced with trails and obstacles used for cross country driving by horses of all sizes. Located in Rochester, NY and with over 30 years of experience breeding and showcasing the driving American Miniature Horse, Kateland Farm continues to provide driving horses, training, lessons, equipment, and equine services and activities for Miniature Horses. While our miniature, Gloria, stayed at Kateland waiting to give birth, we decided it was a great idea to sleep in the barn on the grain bin until she came into labor. Three nights of that was quite enough for a lifetime… and still no baby. But every night staying at the farm, out came Ted from the house around 2am with two toaster’s strudels - one for him and one to share! Thank you for all that you have done for the Minis and our family! Thank you so much for believing in me (a non-driver at the time) and for my lovely Inky. She has won many blue ribbons in Combined Driving at the Preliminary level, as part of my pair, as well as at pleasure shows. She has a forever home with our family here. I cannot put into words how you and your farm have changed my life and that of our family (though I'm sure my husband could find a few words). I am blessed to have a barn full of Kateland horses and a shed full of carriages - life could not be better! Any day spent at Kateland felt special to me, as it provided a true escape from the everyday world. Kateland is a total fantasyland for people who don't have a horse farm! Your dedication to the Miniature Horse is legendary, and I will always be thankful our paths crossed. You have started so many of us on the path of driving safely and successfully. Thanks for helping me get started with my driving pursuits. Ted founded of Kateland Farm in 1989. His passion for Minis and sharing them with others is evident. His herd grew to over 70 Minis at one time. Now, well into his 90s, you can still find him cleaning stalls, fixing fences, and mowing the lawn every day. Star grew up around horses and continues to train in her spare time, in addition to practicing as a Physical Therapist Assistant. Star enjoys bringing a green horse to the show-proven level, then starting all over again with a new horse. Good thing we have plenty of horses here at Kateland.